Welcome to Hostel Lit. 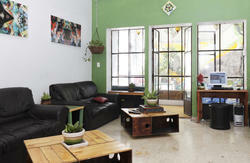 Enjoy a pleasant stay in a youthfull and relaxing environment. Hostel Lit is the new concept in hostels. Offering the best services at the best prices. We offer hot showers 24 hours a day, guest kitchen, terrace and sauna, comfortable private rooms with semi-private or shared bedrooms. In addition, we also provide, wireless internet, snack bar, cafeteria, safe luggage storage and breakfast is included in the rate. We are located in the historic center, a few blocks from the Teatro Degollado, Government Palace, Cathedral and other sites of great cultural significance. Also nearby is the Regional Museum and the Museum of Journalism, the Instituto Cultural Cabanas, Plaza Tapatia and much more. Out location offers easy access to a wide variety of restaurants, bars, nightclubs and shops. We look forward to making your stay comfortable, fun and easy! Located between Ferrocarril and Liberty streets, with easy access from the road September 16, Calz. Independence Av.La Paz., Y AV. Revolution.